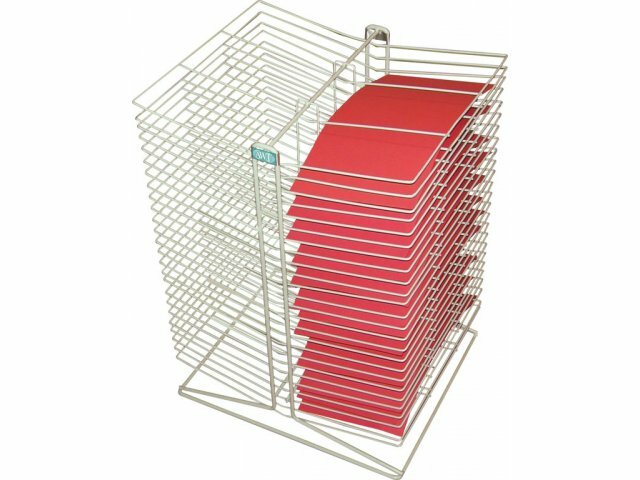 Tabletop Drying Rack - 50 Shelves 10"x18"
If you are short on space in your art-room, these tabletop drying racks are just what you need. Whether you are storing artwork in your classroom or drying prints at your studio, a tabletop rack gives you a convenient, air-drying option. This 50-shelf unit helps you get the most out of your working environment. Like the bigger freestanding drying racks, these tabletop racks are made from all-steel construction. They are powder coated for extra long life. 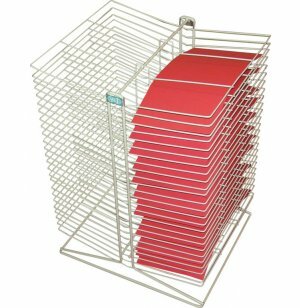 Each shelf is 10 by 18 inches and has six ten-inch mesh openings for air circulation. Double-sided shelves are designed to be rust-proof and non-warping even with heavy daily use. Ultimate Durability: Racks boast an all-steel construction, powder-coated and rust-proof, that will serve you well for many years without warping. Wire-reinforced shelves ensure stable stacking of your projects. Convenient Use: When floor space is tight, tabletop rack allows you to take full advantage of every available surface.